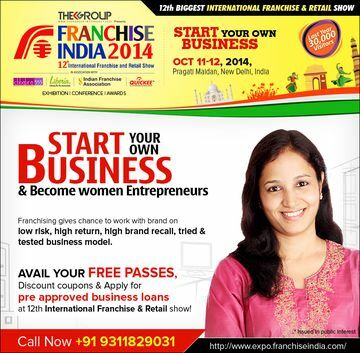 Franchise India, has come up with Women Entrepreneurship initiative. They have taken the initiative to award 25 pre registered women entrepreneurs to start their own business by offering pre-approved loans of 35 lakhs to each applicants for a business opportunity with Natural’s Salon. The gift will be presented to the first 25 preregistered women at Pragati Maidan on October 11th, 2014 during the 12th International Franchise and Retail show. Women entrepreneurship has significant contribution towards economic growth of the country. But the gloomy facet of women entrepreneurs in India is that they are still struggling to grab a major pie of the entire entrepreneurship industry owing to some of the crucial issues – gender discrimination, matrimonial and inherent laws, cultural practices, lack of proper financial model, inaccessibility of right information, network and many more. Some of the speakers participating this year include Ms Swati Popat Vats, Director, Podar Jumbo Kids; Dr Rajni Aggarwal, President Federation of Women Entrepreneurs; Ms Samantha Kochhar, MD, Blossom Kochhar; Ms Pushpa Bector, Sr. Vice President-Head Leasing & Mall Management, DLF Malls India, and many more. The upcoming Franchise and Retail show will provide 100 business opportunities for women to become entrepreneurs with less risk, less investments and less time.